Swimmer hygiene was once a relatively taboo topic. In 2009, we broke the ice by reporting on a survey that found one in five American adults admit to having “peed in the pool.” The floodgates were open! In recent years, we’ve written about the swimming pool as a “communal bathtub” and one in which one in four swimmers would enter within one hour of having diarrhea. Too much information? We think knowledge is power. Are we trying to discourage pool swimming? Quite the opposite: We believe it is important that pool patrons realize they have a role to play in keeping pool swimming healthy and fun. Over the years we have learned that swimming pool myths abound and that some of them may be fueling bad decisions that contribute to unhealthy pools. During a recent radio interview marking the kick-off of our 2018 Healthy Pools Campaign, an interviewer referred to swimming pools as “giant sanitizers.” This is a dangerously misleading characterization. Although it is true that well-maintained swimming pools contain disinfectants for destroying pathogens brought into the pool on the bodies of swimmers, we can’t assume disinfectants instantly zap away every undesirable contaminant introduced into the water. For example, chlorine-based disinfectants are added to destroy harmful microbes, but these disinfectants may be depleted by reacting chemically with swimmer perspiration, cosmetics and body oils. In other words, chlorine can’t tell the difference between bacteria and makeup. It will react with whatever substance it encounters first. Unfortunately, when chlorine reacts with nitrogen-containing substances such as urine and perspiration from swimmers’ bodies, irritant disinfection byproduct compounds are formed that turn swimmers’ eyes red and make their skin itchy. Many swimmers attribute the harsh chemical odor of these substances to too much chlorine and assume it signals an unhealthy pool. In reality, such a pool usually requires additional chlorine to destroy irritants and provide a residual level of chlorine for destroying illness-causing microbes. Because swimming pools are not “giant sanitizers,” it is very important that swimmers shower before entering the pool. The cleaner the bodies entering the pool, the fewer irritating byproducts formed, and the greater the chance that chlorine will be used, as primarily intended, to destroy pathogens. A 2012 study1 by Dutch researchers found a 60 second shower eliminates the majority of contaminants on the human body. Nevertheless, our 2018 survey reveals that 52 percent of respondents never shower before swimming. Only 29 percent of respondents indicated they shower for at least one minute before swimming. Many swimmers shower after swimming. Eighty percent of survey respondents believe the post-swim shower is more important than the pre-swim shower. Here’s where we get on our soap box. Swimmers can shower as much as they like to rinse away pool water after swimming. That’s a personal decision based on comfort. 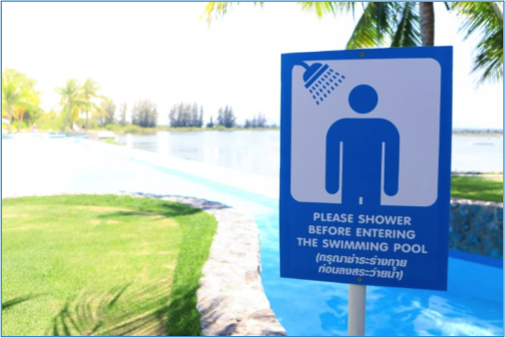 Showering before swimming, however, is a must because a sweaty, unshowered body affects pool water quality and therefore everyone in the pool. Which shower will you take this summer at the pool: pre-swim, post-swim or both? Help spread the word that a pre-swim shower is a matter of public health. Swimmer hygiene need not be a taboo topic. Ralph Morris, MD, MPH, is a Physician and Preventive Medicine and Public Health official living in Bemidji, MN. Chris Wiant, MPH, PhD, is president and CEO of the Caring for Colorado Foundation. He is also chair of the Water Quality & Health Council. 1 Keuten, M.G.A, Schets, F.M., Schijven, J.F., Verberk, J.A.J.C., van Dijk, J.C. (2012). Definition and quantification of initial anthropogenic pollutant release in swimming pools, Water Research 46, 3682-3692.